Details about Rainbow Brite #1 NC Comicon Exclusive Movie Poster Homage Variant SIGNED! 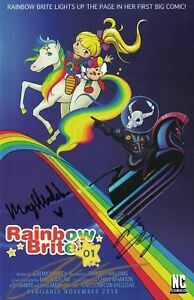 Rainbow Brite #1 NC Comicon Exclusive Movie Poster Homage Variant SIGNED! Item arrived quickly and in excellent condition. I would buy from again. Thank you for the fast delivery!! Recommended!